When talking about flagships, one name that keeps on popping up alongside the likes of Samsung and Sony is Oppo. Needless to say, it has long stopped being a surprise. 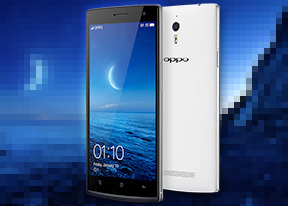 With solid offerings of the past two generations in the Find 5 and N1, Oppo is not just planning to stay in the major league but get a place near the top with the Find 7, one of the precious few smartphones to sport a QHD display. The Find 7 narrowly comes in second to the LG G3 (although in some markets it'll actually be available before it), after Oppo probed the market with its consciously lesser specced 1080p sibling, the Find 7a. There is another variant of the Find 7/7a floating around in the form of the OnePlus One. OnePlus, which initially surfaced as a breakaway company from Oppo, likely has more than a bit to do with their former compatriots than they're letting on, given how similar the One is to the Find 7. Take away the higher-res screen, software UI, and microSD card slot, and they're almost identical devices. Even without the fancy sensors and software features that some of the competition have, the Oppo Find 7 has the makings of a very robust flagship thanks to its capable Snapdragon 801. The QHD display will help enhance the user experience that much more, and is trusted compensate for the lack of other extras. Obviously the screen is the major feature here, but with great resolution comes great responsibility. Contrast ratio, colors, and even battery life and performance were significantly affected on the LG G3 - the Oppo Find 7's only QHD rival at this time - so it's important to see how upping the resolution impacts the overall smartphone experience. To that end, the Find 7 has the more capable chipset and more battery capacity than the 7a, but will that be enough? First thing's first though. Up next we get things under way with our traditional hardware examination of the Oppo Find 7. Not everyone uses same amount of apps as you. Noob. I have 20 gb of apps. Not enough? If not, find a 64gb or 128gb phone.